O.K. engineers - listen up. I'm talkin' watts, amps and horsepower. Let's face it - even if you don't want to admit it, these three things will make any engineer and DIY'er salivate. What's better than creating fantastic food with power tools? Which brings me to my favorite kitchen small appliance. The blender. It's a great addition to every engineer's cooking toolbox. But, what do you need to know when you're ready to make the plunge to buy a blender? Do you really need to consider watts, amps and horsepower? Oh, yeah. You'll encounter a few techie topics if you dig into some of the "internet buzz" surrounding the high price of blenders. Why watts, amps and horsepower really do matter. What's the difference between a glass container and a polycarbonate container - other than the obvious? I have your answers, so, let's get started. Since I don't know how much you want to use your blender, I'll assume you'll use your blender about once a week. I'll also assume you want the best results and you do not want your cooking options to be compromised or limited by your blender's power. Am I right? Here's the bottom line. When you want to pulverize a variety of foods with a wide variation in hardness (i.e. ice to bananas), you'll need all the power you can get. If you intend to crush ice into snow, mill grain, mix bread dough, puree almonds into almond milk, then the more horsepower you can get, the better. Horsepower also protects your blender from an untimely demise from taking on tough tasks. How do you know which one is best, though? How do you compare the power ratings of each blender? This is where the engineer "candy" comes in. For electric motors, one electrical horsepower, or hp(E), is equal to 746 watts. However, not all horsepower ratings are the same. When considering the electric motors in kitchen blenders, the hp rating advertised is a "rated HP" or "Peak HP". Sometimes, the max watts are only specified and not the horsepower. So what's the difference? Can you convert them to common units? It's the maximum motor output at startup (think fractions of a second), but it is not sustainable or practical. If you keep running the motor at peak power, it will overheat and the windings will fail or, most likely, the circuit breaker will trip. One way to measure peak horsepower is the inrush current that lasts for just a split second when the motor is started. There is also a laboratory test that uses a break to slow the shaft until it stops completely; at which point the peak horsepower is generated, but no work is being done because the shaft is stopped. The whole concept of advertising "peak" hp is just a silly marketing tactic, because the motor was never intended or able to operate continuously in this manner. It's just not a practical measurement of the motors true capability. So, be aware when you see "Peak" or "Maximum" when it's associated with a power rating. The true measure of a motor is the maximum continuous output at which the motor can operate without damage to the motor windings or the electrical supply circuit, typically called the rated hp. It's my opinion that peak HP is used to lull you into a false sense of security by thinking that you are getting more than you really are. For instance, the new Vitamix 5200 claims to have a more efficient 2 peak horsepower motor, custom designed for Vita Mix. There is no doubt that this is a powerful motor, very capable of some heavy duty blending, but if the competition doesn't advertise peak hp how do you compare the two? So how does a 2 peak hp(E) motor compare to a 2 rated hp(E) motor? When a blender is advertised to have a motor rated at 1560 watts and 3 peak horsepower, the reality is the blender will never produce 3 horsepower, unless you stick a broom handle in it to stop the blade from rotating. At the instant just before the blades stop turning the peak horsepower will be produced by the motor. But since the blades are not actually turning there is no real productive work being done. So you really are not interested in how much power it can produce when stalled with a broom handle. The rating is used solely for marketing purposes, and it is really quite deceptive. Whereas, the rated horsepower is the horsepower that can be supplied continuously without damage to the motor with the blades turning at the designed speed ... lots of work getting done here. The point is that you may be trying to compare two blenders, one advertises peak hp and the other rated hp or even watts. In some cases you will not have enough information to exactly compare them all, but at least you will know they are playing games with the details when they don't share the same motor specifications. So if the power rating is an important buying decision for you, pay attention to the number of watts (If the motor watt rating is not provided in the sales print, you should be able to find it in the fine print on bottom or back of the blender with the UL rating.). 'Watts' measure the amount of electricity a circuit will consume when it is operating in the manner the manufacturer designed and intended. The upshot. 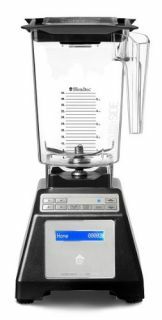 Comparing the advertised watts and horsepower will give you an idea of which blender has a larger capacity for doing work, but the advertised numbers are usually not telling the complete story. Simply focus on the rated watts and the motor warranty, don't sweat over this too much and keep in mind that you may not be comparing apples to apples. There are other features to consider other than horsepower, so as long as the blender comes with a good warranty, has other features you are interested in, and one of the higher watt ratings you should be fine. A BPA (Bisphenol-A) free polycarbonate or glass pitcher? What's the difference? First, it's important to understand why the professional grade blenders with extremely high-speed blades (some as high as 240 mph) choose to use polycarbonate versus glass pitchers. 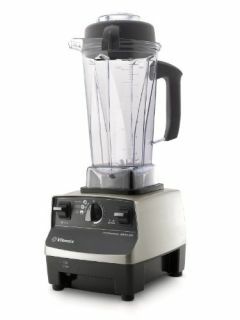 Due to the high- speed blades and high horsepower motors, glass isn't the safest option for professional-grade blenders. If a metal object, such as a spoon or knife, were accidentally left in the blender, a glass pitcher could shatter and potentially cause an injury. Using polycarbonate plastics or copolyester is a much safer option to avoid the hazard of broken glass. Second, the experiments performed that created the majority of the concern around BPA, do not apply to the intended use of polycarbonate pitchers or containers. These experiments involved high temperatures (above 212°F) using a microwave for approximately 30 minutes. It is never recommended to microwave your blender pitcher, because most of them contain metal parts. Therefore, if your pitcher did contain BPA, the risk of BPA entering the food from your blender pitcher is very remote as most blending is performed at relatively low temperatures. One of the primary concerns regarding BPA, is that there are several reports stating that the BPA has an estrogen-like activity. Currently, the FDA has no reason to ban or restrict the use of BPA, but if you would rather not be a lab rat, it's relatively easy to avoid. Polycarbonate (PC) products have been safely used by consumers for decades. Because it is lightweight and shatter resistant, polycarbonate is used in a wide variety of products ranging from CDs, cell phones and safety glass. It's also used in products such as baby bottles and, of course, blender pitchers. Polycarbonate plastic has been approved for food contact use by government agencies worldwide for more than 50 years. During the last decade, there's been an ongoing debate about BPA disrupting natural hormone systems, thereby causing adverse health effects such as "endocrine disruption". The debate started with a very limited study of laboratory animals; it reported reproductive and developmental effects from low doses of BPA. However, when other researchers attempted to duplicate the results, I have not found documentation that they were successful. As everyone is aware, reproducible experimental results by other credible scientists is critical in determining whether a study's findings can be accepted as valid within the scientific community. Because of this debate, the major blender manufacturers are moving to a relatively new material called copolyester, which is as strong and durable as polycarbonate, yet it's formulated without the BPA. Copolyester also touts improved sound dampening, increased resistance to cracking, and improved chemical resistance to some cleaning compounds. Still, the scientific community has deemed polycarbonate plastics food safe for consumer use. The good news? BPA-free copolyester is now an alternative for polycarbonate, and you don't have to worry about the studies, debates and the long-term effects on your family. If you worry about such things, simply select a blender with a copolyester pitcher. Microprocessor controlled Variable Speed Motor? Do I really need it? When considering which type of blender to purchase, at some point you have to decide if you want a microprocessor controlled, variable speed motor or a blender with manual speed controls. As with most things, this is completely dependent on how you plan to use your blender. I believe the microprocessor-controlled blenders have advantages, because they have the ability to vary the speed during a specified blend cycle to help move the contents around the pitcher more thoroughly, which tends to avoid having to remove pitcher from the base to shake it or use a tamper to get complete blending. With a microprocessor-controlled blender, you push one button for each cycle. The blender automatically varies the speed during the cycle based on your choice, stops at a specified time and you're done! The result is a consistent quality product, regardless of who is operating the controls. The user doesn't have to determine when to stop, or the blender speed, so it takes out the guesswork once you learn which of the pre-programmed cycles to use. The automatic shutoff feature that the microprocessor provides is nice, especially for the absent-minded, or the busy mom or employee who gets distracted often. The obvious downside to the microprocessor is increased technology usually equals increased risk of failure. Potentially, you could say there's another component that could fail, but if you decide to go with one of the major manufacturers, the microprocessor components are also included under the warranty. When you hear or read "microprocessor", think solid-state electronics, which have a reputation for high reliability. They continue to be incorporated into more and more devices that we use every day. On the other hand, manual controls allow you the flexibility to have complete control over your blending with the variable speed dial, as well as low/high-speed switches. This allows complete control of the blending, but also requires your full attention during the blend cycle. I like the benefits of added technology, such as microprocessor controls, that free up my hands for other tasks. Compare watts not horsepower ratings, since they can be misleading. Higher watts mean smoother smoothies and a longer motor life. Glass is not an option for more powerful machines due to the safety risk, and in my opinion BPA is not a concern, especially when the major manufacturers have moved to BPA free plastics. Microprocessor controls offer a nice convenience in a busy kitchen with a low risk of failure. Thank you for reading and I hope these details help you in the selection of your next blender. This article contributed by April Jones from www.kitchen-blender-reviews.com a resource for healthy eating tips, kitchen blender reviews and smoothie recipes. For a variety of recipes and cooking tips, join her free newsletter. The article cites Vitamix blenders, then goes on to say that "Personally, I'm not aware of any of the major blenders generating enough heat to reach 212�F." Seems there's a lack of research going on . . . a Vitamix blender will heat food to boiling by shearing and friction alone. In fact this is called for in some soup recipes to eliminate a stovetop or microwave cooking step. Given, the Vitamix 5200 blenders are BPA free according to their website; however, they can easily boil water . . . I've not only seen this demonstrated at Costco, but I've done it (although I started with almost boiling liquid) at home. It takes a LONG time to boil a little bit of water though. I suspect that the Blendtec's could also generate enough heat to boil water if allowed to run long enough as well. This is all great info, and addresses many of the points of interest for engineers and geeks. However, this write-up ignores several design features that, in my opinion, trump motor power when it comes to actual blender performance. First of all, the shape of the blender jar is the single most important feature in a blender. Take the motor out of a $500 Blendtec and use it with the jar from a $20 consumer blender and you won't end up with very good results. Moreover, different jar designs work better for blending different things. 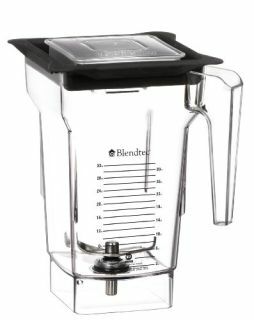 If you are mostly using your blender for smoothies, you might not mind the Blend-tec's square jar. But things like nuts and seeds (and purees of anything thick, really) seem to work better in the vita-prep's relatively round jar, especially because the jar tapers more as it goes down to the motor, acting as a funnel and facilitating the vortex action that propels the material down toward the blades. The variable speed is important, but the microprocessor blenders now features gradual startup routines, so the advantage is less so now than it used to be. Also, vita-preps have the black pusher thing. Its main advantage is not merely being able to push stuff down into the blades without risking hitting them, but rather that when simply left in the jar, it greatly reduces the incidence of an air pocket forming that prevents blending. Without this functionality, greater motor power and speed can actually become DISADVANTAGES because they tend to result in rapid formation of air pockets that halt your blending. Still, it is a shame that manufacturers aren't more open about their motors' power specs. It would be nice to be able to make apples to apples comparisons. But maybe if people stopped fetishizing the motor power, they'd be more willing to be open about it. But all that 1560 watts of power could be going into wasted heat making the true efficiency of the device 0%. The calculation is incorrect. Efficiency should be measured as the mechanical work being performed by the blender divided by the electrical power needed to achieve that work. I just reread that paragraph and it does seem to be a bogus calculation. The correct efficiency would have been the actual watts of power (which we have no way of measuring without specialized equipment) / the measured power from the electrical socket (which we can measure using tools like a Kill-A-Watt). In no way should maximum power output from a wall be involved in any efficiency calculation. That would be like figuring out the percentage of flour to water in a recipe and then somehow involving the mass of all the flour you have in your pantry in the calculation. Let me see about getting April back to address some of these concerns. Wow! This is a great discussion and thank you all for your comments. I will address each of the comments individually. temperatures and quantities you start with. Tonight, I performed a test with my Blendtec using tap water and my candy thermometer. Starting with 21 ounces of 70 degree F tap water, I was able to reach 206 degrees F after six 90 second cycles on "Soup" which is the maximum speed for this machine. It would have taken less time had I started with water at a higher temperature and not stopped the blender to measure the water temperature every 90 seconds. I also noticed that over the course of 9 minutes 2 ounces of water were evaporated from the original 21 ounces. It does take some time, but temperatures above 200deg F can be reached if this is what you are after. I agree there are other important design features to consider when purchasing a high performance blender based on individual needs. Discussing how the carafe shape affects the blending of different materials would be a great topic. The carafe shape can also change the degree of difficulty for cleaning up after blending foods like nuts, especially when you are trying to get the last little bit out of the bottom. You are correct ... the calculation is bogus ... rated power divided maximum supplied power does not equal efficiency. I was attempting to highlight (as you have also done) that manufacturers don't supply all the needed data to make an apples to apples comparison. I should have asked for help on this topic from someone with more of an electrical engineering background. Thank you all of highlighting the error in my approach. Any suggestions as to how to make this comparison without having all the data? Subject: That ain't Ohm's Law. The equation that you posted, P = V x I, is the power in a DC circuit. It is a rough approximation of the power in an AC circuit. The section discussing electrical efficiency and power calculations has been removed due to inaccuracies (and getting to the point where the electrical discussion would be accurate wouldn't add much to understanding the power of a blender). The sentence concerning blenders generating enough heat to raise the temperature of water to 212°F has been removed since this was demonstrated to be possible on both Blendtec and VitaMix blenders. I have to inject a note of doubt in relation to the BPA statements made in this article. To characterize the research on BPAs as "isolated and unreproducible" seems wrong, given this article on science news. "Of 11 studies of the compound's effects at low doses, none funded by industry reported impacts. In contrast, 94 out of 104 government-funded studies found effects." Has anyone uncovered a study that shows leaching from food-grade polycarbonate containers at room temperature? The only study that I'm aware of was one from over five years ago that showed leaching from polycarbonate hamster cages. I don't know enough about plastics to know whether the GE Lexan is the same as all polycarbonate (that is, can the hamster cage leaching be proof that older Nalgene bottles and Rubbermaid Commercial polycarbonate bins used extensively in the food industry leach?). I've always been bothered by VitaMix listing their blade speed as miles per hour. Shouldn't we be talking in terms of RPM? Or something equivalent? In their specs, the blade speed is listed as 240 mph. 240 at the tip of the blade? I was ready to go crazy and buy a Vitamix after a Costco demonstration, but decided to go home and think, as well as check out reviews. The Amazon reviews convinced me not to buy, and after weaseling around, I couldn't find a good reason for getting either Vitamix or Blendtec. My main issue has been burning the motor out due to making very thick (honey-like) mixtures. Consumer Reports suggested that a Ninja was almost as good as the Vitamix, so I checked Amazon regarding that product, and I see complaint after complaint about the plastic shattering and/or coming apart. I have had a long love affair with glass: I've worn glass glasses for almost 60 years, preferring the superior optics despite the weight, and have never had them shatter. I've never had any glass cookware shatter other than from an unfortunate encounter with the floor. As far as BPA is concerned, the probability of BPA being leeched out of glass is zero, and what you fail to consider is that the kind of solution you are using in your plastic container will increase the probability of the BPA (or other plasticizers) leeching out. It does possess some solubility in water, much more, though, in organic solvents. See http://pubchem.ncbi.nlm.nih.gov/summary/summary.cgi?cid=6623#x27. You would have to measure that leechability when the blender is being used to mix food that is variously acidic or oily, for instance, or even alcoholic, and you would have to do that at various temperatures. You would also have to consider the change in the plastic as it ages with regard to the chemical and physical stability of whatever BPA might be in it. In other words, I don't believe that one could claim that no BPA leeches out without testing a variety of possible mixtures or solutions that the user might come up with. I don't know whether these numbers would be non-zero or not, but I doubt it, and, again, the concentration from glass is zero. In addition, plastic gets much more surface scratches; it stains, and it cannot be cleaned perfectly. I don't like cooking with or using plastic, except as an end-storage container. If the glasses are so heavy that they're going to sink your nose into the nasal cavity, then I could understand going with plastic. Mine are -4.25 -50 x130 (right) and -3.75 -50 x035 (left) [sphere, cylinder, axis]. I have tried various plastic lenses several times, and what has driven me crazy is not chromatic aberration so much as the distortion at the edge of the visual field, which I find particularly disturbing when driving, especially at night. It's getting harder to find glass lenses, but I do note a Canadian company that still has high index ultra thin glass lenses that should work well in cases of extreme myopia: http://www.visionsofcanada.com/csi/awb/voc/high-myopia.asp. A separate problem is that the opticians tend to try and sell smaller lenses in glass, since they worry about the weight, and, unfortunately, when one is used to gigantic lenses, a shift in lens size can create difficulty in adjusting. I find myself still reverting to a 1996 pair of no-line trifocals with PhotoGray in Flexon frames--the best pair I ever had, also, coincidentally, the heaviest, and with the largest lenses. Opticians seem to have no understanding of physics as they try to "convert" me to the plastic religion. Fascinating! Thanks for the links. A correction to your statement about max/peak power. The maximum power of an electric motor occurs at 50% speed not right before stall. The maximum torque occurs at stall. Subject: Boiling water in blenders. I, personally, have started with room temperature water (70�F) and brought it to boiling (212�F) in a Blendtec. I used to sell them and I'm a tea drinker. No hotplates in the demo booth. Why the discrepancy between stated hp and watts. If 1 hp = 746 watts, can you have a 1800 watt unit with 3 hp (ie. Cleanblend blinder)? if you read the original article and some of the follow-up, you'll see that manufacturers play with numbers to make things look really good. the three horsepower claim is most likely what is described as 'peak' hp - not much relationship to actual use. 'modern day' kitchens typically have 20 amp circuits in the kitchen, older homes perhaps 15 amps. you can figure the available wattage from there - something advertised as 3500 watts sounds good, but probably will trip breakers under (heavier) load. My friend was telling me his induction cooker (common here in India) is 1800 watts. Can you work out the RPM of blenders from their wattage? as against the Ninja Nutri Blender BL450(NZ) at 900 Watts. how fast they really are? it is not possible to calculate rpm from wattage. sorry. great article. The article was very informative and the explanation was easy enough for a non engineer to understand. I know I'm quite late to the party here, but I just posted an article discussing Vitamix horsepower that I thought you might be interested in. I measured input and output power (peak and sub-peak), and also wrote about how the power depends on what you are blending. the proposed theory that the power of a device depends on what it is blending is,,,, well - a non-starter. that one liquid or the other heats up faster does not mean it changes the power of a blender. It depends on what you mean by "the power of a blender." What I meant when I said "the power depends on what you are blending," is that both the input and output power depend on what is being blended. I am 100% certain of that. Is RPM important? I am looking at a blender with 1200w but only 3000 rpm and one with 1000w but 25,000 rpm. I was surprised the rpm is so different when there is only a difference of 200w. RPM is important, but I wouldn't use it as the main means to compare blenders. There isn't a standard for what manufacturers actually mean when they give you an RPM number. Sometimes it's a "bare motor" speed (which is the maximum speed of the motor, if it weren't connected to anything), and other times it's an actual operating speed. And even then, the RPM usually depends on what you are blending. All that said, 3,000 RPM sounds super low for a 1200W blender. I think it's either a typo, or a different kind of machine. Subject: blending watts vs h.p. Thanks for the info, now I want to buy a new blender, but I can't choose which one. A good comparison found on the site . And I think to take the Vitamix 7500 Blender. I will be glad to any advice which blender I should choose!